Those Signs, Again | From the Seasonally Occupied Territories . . .
As I left the library after taking the picture, a fellow was coming in, camera in hand. He asked me where the sign was — you know, the signs that have been in the papers? I gave directions: turn left, when you get to the main desk turn right and look up. He thanked me. I suspect he’s on a treasure hunt, and that he’s not the only one. The signs are scheduled to come down today or tomorrow. Maybe the conversations about them will continue. I’m listening. 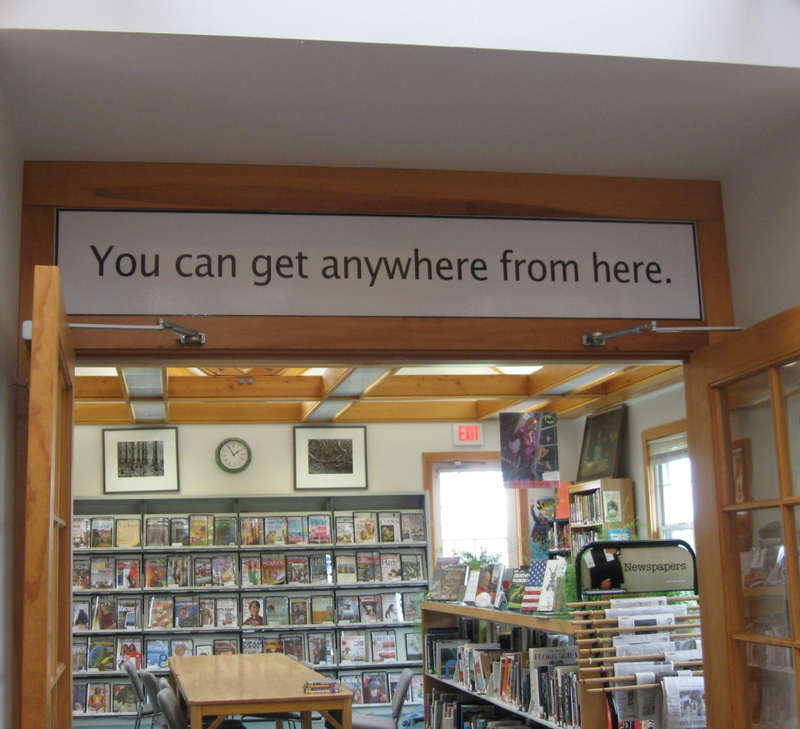 This entry was posted in Martha's Vineyard and tagged arts, Julia Kidd, West Tisbury Free Public Library. Bookmark the permalink. My partner, the medical librarian for a hospital in Santa Fe, has had the fantasy for years of putting up a sign over the library door: I DON’T KNOW AND I DON’T KNOW HOW TO FIND OUT. The message may show the sense of irony here, and a difference between some Massachusetts towns and New Mexican ones. As may the fact that he only fantasizes about his sign. If he makes it, I know a few librarians who would love to have a copy. A variation might be I DON’T KNOW AND I WANT YOU TO FIND OUT FOR ME.